Why China Should Be Your First Choice! There are more fantastic WOW days in China, than any other tour in the WORLD! We have the BEST itinerary to China!!!! We visit sites that other companies have yet to discover. We include both the Li River and the Yangtze River, we stay in 5-star luxury hotels throughout. All of our cabins on our 5-star ship on the Yangtze are mini-suites, with over 300 square feet. 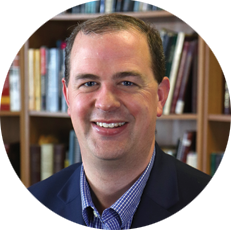 We include tour managers and a special educator to enhance your experience. China is the best tour in the world! We have made it even better! The owners of Fun For Less Tours favorite country in the world is China. They have spent many weeks on their own exploring all over China. Every place you visit and see in China they experienced first. Our tour is not like any other; we didn’t copy someone else’s tour, others copy our tours. In 2017 the owners again spent time exploring other parts of China. Because of that trip, they are making MAJOR improvements to our 2019 China Tour. It includes a site never visited by an American Group. When they were there in 2017, they were told less than 50 Americans had ever seen what you are going to experience. We already have a record of bringing many things not offered by other companies. Dazu: for over 1,000 years monks carved life-size figures out of stone. They have over 60,000 stone carvings in the Dazu Grotto. We were the first to bring American Groups. When we went the first time, there were only a few backpackers. It has since become popular UNESCO World Heritage Site. Shenzhen China Cultural Village: Think of the Polynesian Cultural Village in Hawaii, and you will get an idea of what this is. The Chinese asked the Polynesian Cultural Center in Hawaii to help build them a Cultural village that would display the dress and customs of their many ethnic tribes inside of China. The China Cultural Village is a huge hit with our passengers, and it also has GREAT Cultural Shows. As far as we know, we are still the only company that has ever brought American Groups to the China Cultural Village. Zhangjiajie Mountains: We were the first ever to bring American groups to Zhangjiajie. This is likely the most beautiful place on Earth. It is where they filmed the floating mountains of Avatar. Yes, those mountains actually exist, they filmed them at Zhangjiajie and then cut off the bottoms to make them float in the movie. This is a highlight of highlights in China. Very few companies offer both the Yangtze and the Li River in one tour. Usually, you have to pick the Li River or the Yangtze; you can’t do both. If you are going to China, you need to do both. Bottom Line: We designed our tour to bring the very best of China, you will see and experience more with us than any other company. China should be your #1 Choice. There are more WOW days in China than you will find on any other tour anywhere in the world. Now we have added three additional sites to visit – we have made it even better! 3 NEW Major Additions To Our China Tour! After our owners last exploration trip to China in 2017, we have decided to add three major improvements to our already unique tours to China. The following additions will start in 2019. 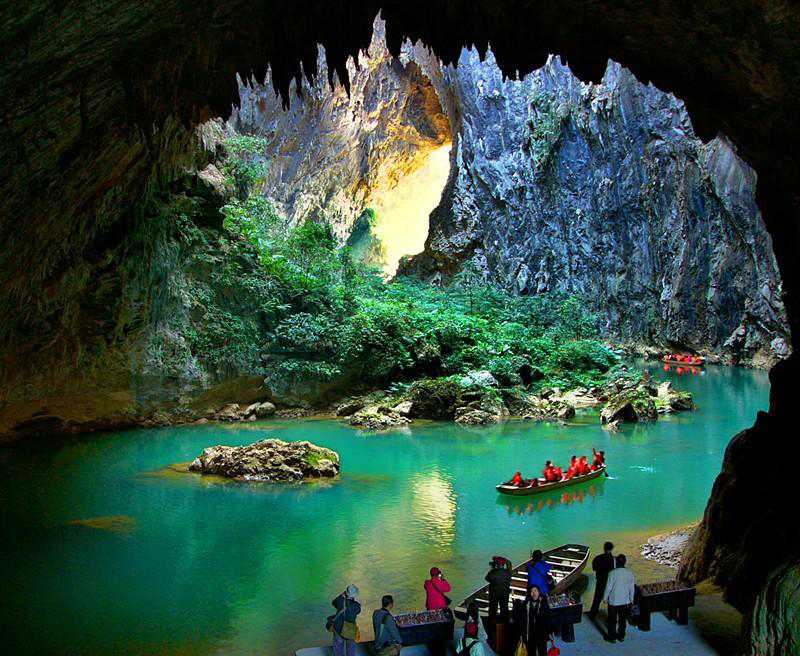 The Qingyuan Lianzhou Underground River – Another First! We will be the first ever to bring American groups to this unique underground river cave. 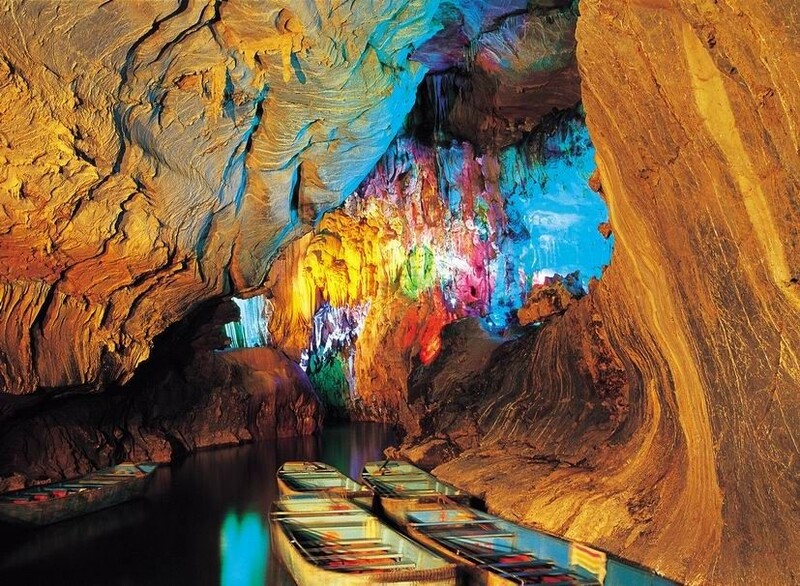 Inside the cave, a zigzag river runs through three little picturesque gorges which are respectively called ‘Longmen Gorge,’ ‘Lotus Gorge’ and ‘Banana Gorge’ according to their shapes. You will travel by boat about two miles roundtrip on the river running through possibly the most beautiful cave you will ever experience. 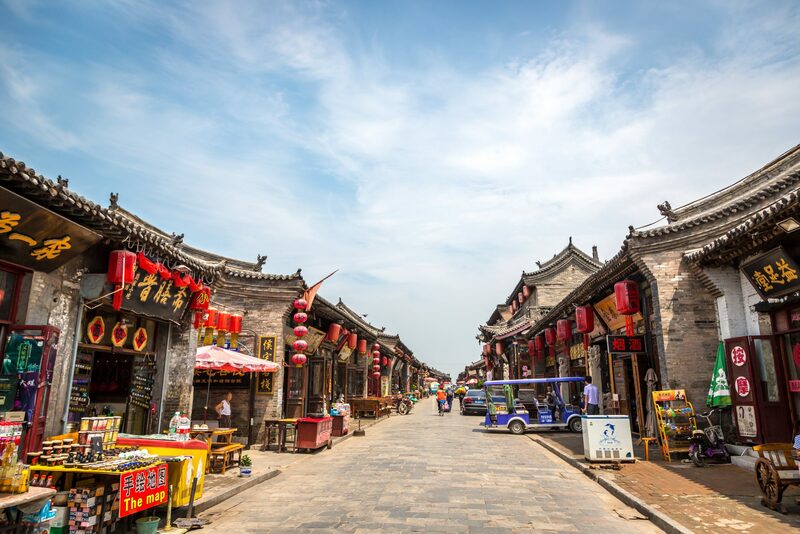 Pingyao: China’s best-preserved ancient walled town. The whole town is a UNESCO World Heritage Site. It is often called a living museum. Even though the ancient walled town is hundreds of years old, the building are all lived in. The first banking system in China started in Pingyao. This will be a major highlight. Guangzhou Zoo and Shows: A great place to see Pandas is at the Guangzhou Zoo. The Zoo also has many animals shows to enjoy. We will also enjoy a fantastic evening show across from our luxury hotel. High-Speed Trains: When you consider the time driving to and from airports, time waiting to board your flight, along with flight times – high-speed trains often take less time and are more enjoyable. The only issue with high-speed trains in China is where to put the large suitcases Americans travel with. We solved the problem, by trucking your luggage to your next city while you travel comfortably by high-speed train. With other companies, you will end up with your luggage where your feet should be. Your luggage will arrive the same day, just a little later. When you return from touring your luggage will be in your hotel room in the next city. NO one else has this service!!! Important Note: Our price is a complete package. We do not give you free afternoons and then charge you more for additional touring or evening cultural shows!!! Many travel companies show a low price, but by the time you add everything in, they become expensive. Our pricing is a complete package that will actually give you more for less! 5 Star Luxury Hotels throughout. 4 nights 5 Star Luxury Cruise Ship on the Yangtze. All rooms are mini suites with private balcony – over 300 square feet. All shore excursions off of the ship. All ship taxes and fees. All Flights and High-Speed Trains. Shenzhen to underground river cave by high-speed train. Underground river cave to the Li River by high-speed train. Li River to Guangzhou by high-speed train. Xian to Pingyao by high-speed train. Pingyao to Beijing by high-speed train. Air flight Guangzhou to Zhangjiajie. Air flight Chongqing to Xian. Special Service others do not do: We take all large pieces of luggage by truck to the next area when traveling by high-speed train. Our passengers do not have to handle luggage. Li River Cruise: Very few tours offer both the Li River and the Yangtze on the same tour. We include both! The China Cultural Village: China wanted a place to display and celebrate their many ethnic tribes in China. They asked the Polynesian Cultural Center to help design their Cultural Village. Small Group Bus: 30 to 35 passengers on a 50 passenger bus. Guangzhou Zoo – Includes pandas and shows inside the zoo. Quality Meals: The quality of the meals can make or break your tour. We have the quality! Breakfast is included every morning in China and dinner is included on all but two nights in China. Also, lunches are included during your Yangtze cruise. All buses, guides and entrance fees. Gondola and cable car rides at Zhangjiajie. All transfers, to and from hotels, airports, train stations and ships throughout China. All land taxes, hotel taxes and airline taxes inside of China. Cities Visited: Hong Kong, Shenzhen, Guilin, Guangzhou, Zhangjiajie, Yichang, Chongqing, Dazu, Xian, Pingyao, Beijing, plus many other small cities on the Yangtze. Special Guest Educator: Taylor Halverson. “Whisper Perfect” headset receivers. You can hear every word clearly, even when you step away from the group to take that important picture. Option to purchase our 5-night extension to Bali, the most beautiful island in the world! Price does not include airfare into Hong Kong and home from Beijing. international airfare, China visa and tips. Salt Lake City round trip airfare regular tour: $1,278. Salt Lake City round trip airfare Bali Extension: $1,727. Other cities: Call our office to get a quote from your own city. You can also purchase your own airfare if you want. If you are flying with the Fun For Less group airfare you will depart from your home this evening. You will have a layover in Los Angeles and then catch your evening flight to Hong Kong. You will depart from Los Angeles around 1am today. We will then lose a day as you cross international date line. We arrive into Hong Kong around 7:30 am. Upon arrival, we will do a city tour of Hong Kong that includes a boat ride on old sampans through the harbor of Hong Kong. After our city tour we will transfer to the hotel in Hong Kong where we will overnight and you will have the afternoon free to enjoy. Today we will have a late morning departure where we will travel into mainland China to the city of Shenzhen and the China Cultural Village. The Chinese Government worked with the Polynesian Cultural Center in Hawaii to create their China Cultural Villages featuring the many ethnic groups found in China, like Mongolians, Tibetans, etc. After our visit to the Cultural Village, we will overnight in Shenzhen. This morning we will take a high-speed train from Shenzhen to near the Lianzhou Underground River. 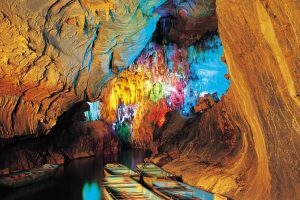 We will then drive to the entrance of the underground river. 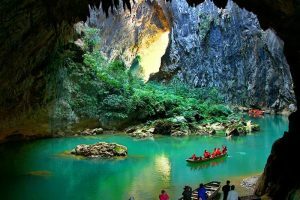 We will travel by boat on the river (approximately a mile in and a mile out) running through what could possibly be the most beautiful cave you will experience with its odd-shaped stalactites, steep cliffs and waterfalls. Then we will return to the high-speed train to continue onto Guilin and Li River. Where we will overnight. This will be a highlight day as we sail on the Li River through some of the most beautiful and unique rock formations found anywhere in the world. The scenic drive to and from the Li River is filled with terraced rice paddies. Early this evening we will take a high-speed train to Guangzhou where we will spend the next two nights. Our hotel is located right next to the zoo. They have a free shuttle back and forth between the hotel and the zoo. It is possibly the best place in China to see pandas. They also have animal shows inside of the zoo. You will have free time to enjoy the zoo and relax at the hotel. This evening we will enjoy a fantastic show located right across the street from the hotel. This morning after breakfast we will fly to Zhangjiajie. Upon arrival into Zhangjiajie, we will drive to our hotel where we will spend the next 3 nights exploring this magical place. Overnight at the Sunshine Hotel Zhangjiajie. Today you will explore Zhangjiajie National Forest Park with a cable car up to the “Tianzi Mountain Nature Reserve”. You will have a bird’s eye view of all the mountains and valleys of the Wullingyuan scenic area. This morning we will breathe the fresh air in Zhangjiajie National Forest, see the wandering Golden Whip Stream, visit the Four Gates with Plenty Water, where four streams pass through mountains and form four natural gates. In the afternoon, we will visit Tiananmen Mountain scenic area. This morning we will take a beautiful long drive (between 5-6 hours) from Zhangjiajie to the 3 Gorges Dam and our 5-star luxury ship on the Yangtze. We will spend 5 days 4 nights cruising the beautiful majestic Yangtze River. Cruising the Yangtze can be more beautiful than cruising the inside passage of Alaska. With lush green mountains, manicured farms and fjord like 3,000-foot cliffs, you will be awestruck by its beauty. We will start our day by visiting the world’s largest man-made dam, where you can see the locks of the 3 Gorges Dam. The ship’s locks of the Panama Canal pale in comparison. Spectacular, unique, mystic and magical are the adjectives describing the magnificent scenery along the 3 Gorges, unfolding on a monumental scale, equal to the Grand Canyon. Today we will go through the Misty Gorge where you will see exquisite peaks, grotesquely shaped rocks and silvery waterfalls. We will start our day with our shore excursion into the Three Lesser Gorges. This is one of the most beautiful places on earth. We will then return and continue sailing through Wu Gorge and on to the grandest Gorge on the Yangtze, the Qutang Gorge. Today we will visit the Red Pavilion of Shibaozhai. The temple at the top was built between 1736-1796. In 1819 they built the 9 story pavilion to help monks get to the temple. This morning we leave our 5-star luxury ship on the Yangtze in Chongqing and then drive back into the mountains to visit the special stone carvings of Dazu. Here monks have been carving life-size stone carvings for over 1,000 years. There are 60,000 of them! Most of our passengers have liked this site as well or better than the Terracotta Warriors in Xian. A MUST SEE IN CHINA. This place is rarely on tours offered by others and again will be one of your favorite highlights of China. We will return to Chongqing to take our flight to Xian. Xian is the capital of 11 dynasties and one of the largest medieval cities in the world. We will overnight two nights in Xian. This morning we will visit one of the world’s great archeological treasures, the Terracotta Warriors. Here you will marvel at the thousands of soldiers, archers, horses and chariots that were buried with the Emperor Qin Shi Huang more than 2,000 years ago. Then we will see Xian’s ancient city wall. This may be the best-preserved city wall in the world. Dating back over 500 years, the ancient city wall stretches almost 9 miles around the city with its moat and drawbridges still intact. The top of the wall is wide enough to put 4 semi-trucks side by side. Later we will visit the Wild Goose Pagoda. This pagoda is a 7 story square tower and a holy place for Buddhists. Xian reached its peak during the Tang Dynasty and is rich with cultural and historical significances. From 618-907 AD, the Tang Dynasty presided over one of China’s most glorious cultural periods. This evening we will attend one of the best cultural shows you will see anywhere in the world – The Tang Dynasty Dinner and Cultural Show. This fantastic show is full of music, dance and colorful traditional costumes. This morning we will take a high-speed train to Pingyao, which is considered to be China’s best-preserved ancient walled city. The whole town is a UNESCO World Heritage site. It is often called a living museum. Even though the ancient walled city is hundreds of years old, the buildings are all lived in. The first banking system in China started in Pingyao. This is will be a highlight! Later we will return to the high-speed train and travel to Beijing. We will overnight 3 nights in Beijing. Today we will visit the Temple of Heaven and then head to the Summer Palace (the summer residence of China’s Emperors. This afternoon we will make our anticipated visit to the Forbidden City. A huge complex of palaces, pavilions, courtyards and gardens. The Forbidden City was off limits to common people for over 500 years. Early this morning, we will travel 40 miles north of Beijing to the Great Wall. This extraordinary 4,000-mile long fortification was built to thwart the barbarian invasions. A walk along the enormous towered and turreted wall is spectacular. We will return to Beijing where you will have a free afternoon to shop at Silk Alley or relax before your flight back home. This afternoon you will fly home. This is highly recommended: Bali has been voted the most beautiful island in the world. You are already in the area, it is too fantastic of a deal to pass up. 5 nights in 5 star luxury hotels. Your hotel in Bali is the Muila Beach Resort (Voted #1 Beach Resort in the WORLD!) beating out Four Seasons and Ritz Carlton beach resorts! This is an opportunity of a lifetime – to stay in the BEST beach resort hotel in the whole world! All tours, buses, guides and entrance fees during your time in Bali. Possibly the most beautiful rafting experience in the World. Tour managers from Fun For Less Tours “We Don’t Send You, We Take You”. *If NOT purchasing OUR group airfare – your cost for round trip Hong Kong to Bali round trip airfare will be $449 pp. Today we will have a late morning departure where we will transfer to the Hong Kong airport for your flight to Bali. Upon arrival into Bali, we will transfer to the hotel and overnight for the next 4 nights at this beautiful resort. Free day to enjoy your fantastic beach resort. Full day tour of Bali. You will see beautifully layered rice paddies, and also enjoy one of the most beautiful rafting experiences in the world as you float by moss-covered cliffs and deep jungles in the middle of Bali. We will then visit Tanah Lot before returning to our hotel. This morning you will travel to the airport and fly back to Hong Kong. We will arrive a little after 2 pm. After our arrival, we transfer to our hotel. Tonight we will meet the group not doing Bali. The rest of the tour we will be together.